The Nintendo Switch with pink and green Joy-Cons is only available at Walmart – for now. If you’ve been struggling to find a Nintendo Switch, you’re in luck with the newly announced Walmart Splatoon 2 bundle. 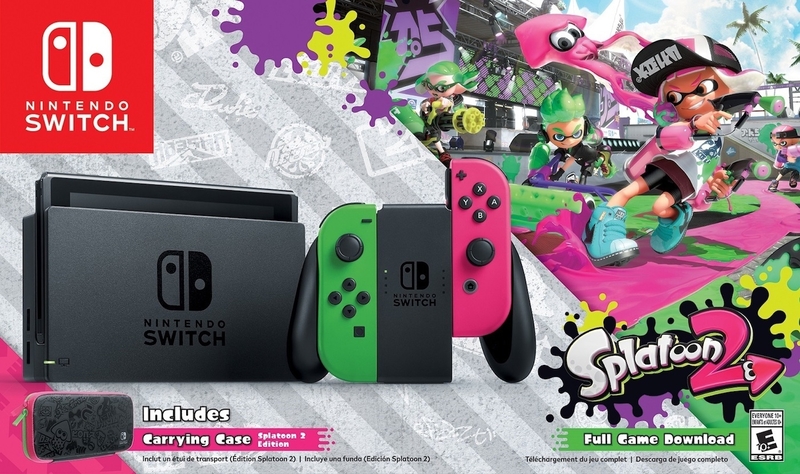 Nintendo announced the bundle for North America which comes with the pink and green Joy-Cons in keeping with the Splatoon 2 theme, rather than the bog standard grey, or neon red and blue. The bundle includes a super snazzy carrying case for your Switch when you’re on the go and want to stay fresh – that’s what all the squids are saying these days, right? – and of course, a download code for Splatoon 2. You have until September 8 to scrape together the $379.99 it’ll cost you to pick one up. In Europe the Splatoon 2 bundle came with neon blue and red Joy-Cons, although the pink and green ones are available to purchase separately, along with the carry case. The bundle “offers fans in North America their first chance to get their hands on that Joy-Con color combination,” according to the press release, suggesting the new Joy-Con colourway will eventually be sold on its own. Will you be grabbing the Splatoon 2 Walmart bundle? Let us know in the comments.